Those of you lucky enough to be at the Lakers’ game on Monday — perhaps even sitting in the luxury of the Staples Center Suites — were treated to some NBA history. Okay, so your hometown Los Angeles Lakers continued to struggle, getting their asses handed to them by the Golden State Warriors, 130-111, and have now slipped out of a playoff spot. But if you’re a fan of the game, you had to appreciate the spectacle you witnessed as Warrior guard Klay Thompson tied an NBA record by canning his first 10 three-point attempts of the game. All told, Thompson went off for 44 points in just 27 minutes, and he simply couldn’t miss, nailing 17-of-20 from the floor, including 10-of-11 from beyond the arc, while adding two assists and a block. He’s now shooting 50 per cent from downtown over the last five games, and despite seeing less PT in January, is enjoying his finest month of the season. Overall, Thompson is doing a slightly better job on the offensive glass, but he’s averaging just two assists, which matches his career low from his rookie season. Regardless, he’s having a season that rivals anything he’s done in his career. While the Lakers are sliding, the Warriors are on fire, matching a season-best with eight straight wins. This run has Golden State back on top in the West, snatching the No. 1 seed back from the upstart Denver Nuggets. The Warriors got off to a middling start on the road this season, but with seven straight wins away from Dub City, they’ve now won 15 road games — tied with the Raptors for most in the NBA. With Thompson owning it, Kevin Durant didn’t need to do much on Monday. KD shot well (8-for-13, including 1-for-2 from downtown), but fewer touches resulted in just 20 points, and he only managed six boards and four assists. He did block three shots, so the night wasn’t a total loss from a Fantasy perspective. Durant has also been on a roll from outside lately, taking — and sinking — more trey attempts over the last week and a half. He’s enduring his worst FT shooting (86 per cent) month of the season, but is still having a career season in that regard, so it’s hard to complain. Overall, Durant is seeing his most PT since coming to Golden State, and it’s resulted in his finest performance as a Warrior so far. He’s also proving to be a real leader on this team (see video below). Stephen Curry had an off night offensively (3-for-12 from the field, 2-for-10 from beyond the arc), scoring just 11 points, but somewhat salvaged his performance by playing the facilitator, dishing a dozen dimes. His PT is down a smidge lately, but in January, he’s matched a season high by averaging one offensive rebound. Overall, Curry is enjoying his best season since 2015-16, and with the Warriors’ big three rolling, they are going to be very tough to beat in the playoffs as usual. Could we be looking at the first threepeat since the Lakers at the outset of this century? Speaking of the Lakers, SF Brandon Ingram has been on a nice roll lately — especially impressive since he’s taken over at PG with Lonzo Ball out. Ingram scored 17 points on Monday (after potting 21 on Saturday), nailing his only trey, shooting decently from the line (for him) and adding five boards with three assists. Owing to a crappy performance on Thursday, his bucket count is actually down a bit lately, and he has struggled from the field in January. Shooting woes have been an issue for Ingram this season as his FG percentage has dipped after showing such great progress in his sophomore effort in 2017-18. It’s one of the things that’s stopping the 2016 second overall pick from taking the next step in his career. 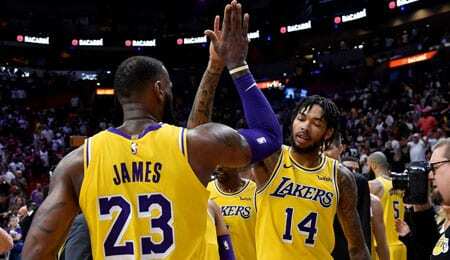 In fairness, Ingram was probably the Laker that was going to be affected most by the addition of LeBron James, and given that the kid’s overall performance has only slightly regressed, you might even call that a win. Still, in the long run, the Lakers will need Ingram to become the player they expected him to be. One young Laker that has taken a nice step forward this season is PF Kyle Kuzma. He wasn’t particularly good on Monday, but didn’t miss from the charity stripe, so there’s that. Kuzma has seen more PT lately, and has really responded (recording back-to-back 32-point games last week). His bucket count is actually down a smidge this month because of his poorest shooting of the season, but overall he’s shown growth in almost every facet of his game — except rebounding. Kuzma is a bit undersized at the four, and while he excelled as a rebounder in college, we’re still waiting to see that manifest itself in the NBA. Now it’s your turn. Let us know in the comments below whether the Golden State Warriors will again be NBA champs or if someone can topple them. KD, meanwhile, did sacrifice some of his numbers coming to Golden State, but not dramatically so. Yes, his touches were at a career low, but he compensated for that with his best FG percentage yet. What hurt more for Durant was fewer three-ball attempts and a lower success rate from beyond the arc. Zeller has been mostly stellar (yes, we’re poets at heart) over the four games (okay, maybe not so much over the last two). Regardless, his season-high of 20 points with six boards and two blocks on Monday did raise some eyebrows. With Jefferson (calf/suspension) out, Zeller will try to take advantage and gain more minutes and confidence in the low post. Playing pivot is giving Zeller a chance to shine in areas we don’t normally expect from him; he’ll contribute with boards, points and occasional blocks. Montiejunas has yet to play this season because of his back, but he’s very close to returning. He’s been practicing this week and his status for Saturday has been upgraded to questionable. The Young Lithuanian enjoyed a breakout last season, upping his game offensively while doing a better job on the defensive glass and pitching in with more blocks. In a deep league, stash this dude now.